A great starter home w/plenty of room for everyone or the perfect move-in ready retirement home! 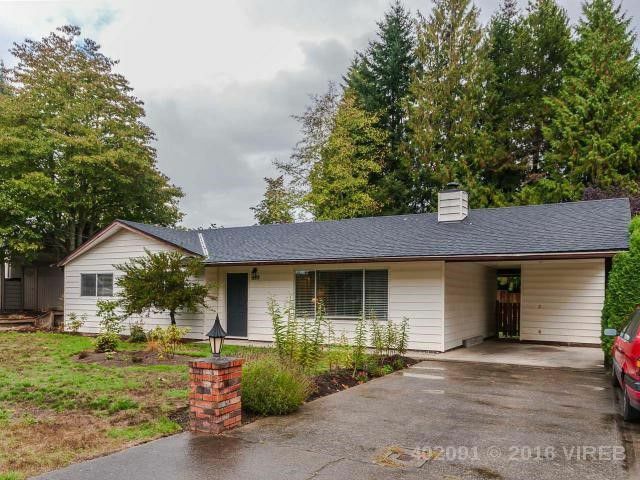 Nestled on a quiet street in the sought-after area of "Qualicum Woods" you'll find this light bright rancher boasting extensive renovations/upgrades & a splendid location just a short drive to 2 golf courses, downtown Qualicum, & the beach! Classic & comfortable rancher layout incl open plan Living/Dining Rm w/engineered hardwood floors, traditional brick FP (wood), & BI ceiling speakers. Skylighted Kitchen w/concrete CTs & slate tile floors. Enjoy a quick snack at the breakfast bar, a meal in the skylighted Dining Room, or an outdoor dinner on the patio. Skylighted Master Suite w/new lighted ceiling fan, 2 good-sized Beds, Laundry Rm w/slate floors & exterior access, both Baths completely renovated top-to-bottom. Huge fully fenced backyard w/treed backdrop, garden areas, & shed.